Make room and organize your gadgets! 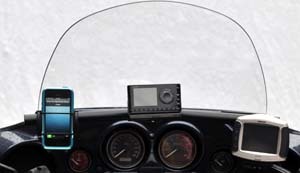 If you are serious about touring and riding, and you like good looks and functionality, this is the product for you! 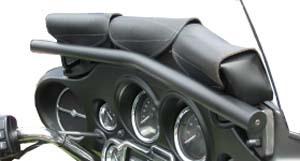 Bagger Gadget Bar fits 1996 and later Ultra Classics, Electra Glides, Street Glides and Trikes with H-D batwing fairings. Don't limit yourself to the handlebars...move on up! 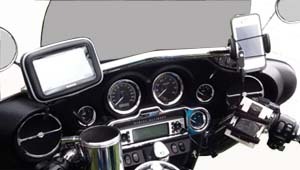 Mounts mirrors, MP3, cell phones, fuzz busters, GPS allowing for multiple gadgets to be mounted. 2. Remove screw next to the adjustable airvents. 3. 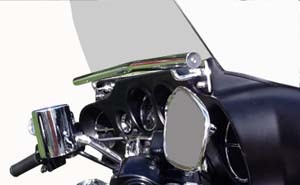 Place bar on fairing, hold in place with clamps (provided). 4. Mark mounting holes with bar in place. 5. Remove bar and clamps. 6. Drill the marks with 5/16 drill bit. 7. Place bar back on fairing & mount with four socket head screws & acorn nuts. Tighten and apply thread locker. 8. 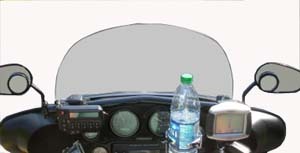 Replace windshield and all screws. Mount gadgets.